In this game you have to be ready to become the best surfer. Do you think it's easy enough? Then we wanna to check it. Avoid all obstacles and reach your aim, before the time runs out. Be sure that you will have a lot of fun! We propose you to play the most exciting surfing game. It is time to shoe everyone that you are the best sportsman in the whole world! Use the mouse to steer. Left-click for surfer stunts. Watch out for obstacles or you will eat it. Hit peaking waves to go airborne, then left-click to perform midair stunts. Pull off consecutive stunts for. 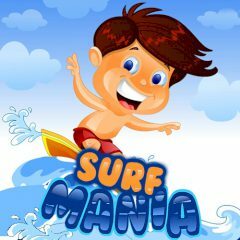 Get on your surf board and ride the waves, collect stars to reach the target score needed for each level before you run out of time. Are you ready for such a coll challenge? We do not wanna to prevent you!